Traditional publishers still expect a solid marketing plan for every manuscript submitted for consideration. But, with the recent rise of independent publishing, more often than not, authors make the decision to back their own work and take on the role of a small publishing house in order to bring their books to the public. An added benefit of choosing this route is that they retain 100% of the rights to their book. What does this mean? For most of the books I have had published traditionally, I made $1 per book. Contrast this amount with the $5-$10 a book I make when I self-publish. Where traditional publishing relies on literary agents to act as middlemen who are expected to judge both quality and market viability for hopeful writers, smart self-publishers invest both their time, talents and money into producing, often, equally great books. In either case, having the clear idea of how to market your book is just as necessary. Think of becoming an author like starting a new small business. Would you jump into that blindly with no plan? The next question on your mind is probably, well, how do I create an effective marketing plan? 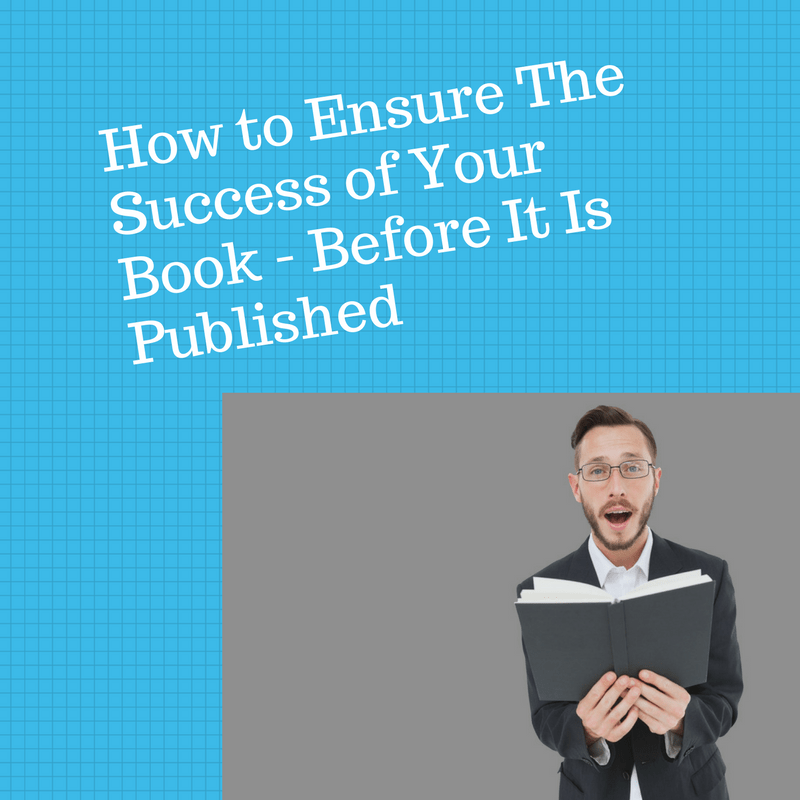 How can I ensure that my first book will be a success before it’s even ready to be published? Start by imagining every author’s worst nightmare: you have published your book and no one is buying it. No one is interested in reading it at all, in fact. How did we end up here? Often your failure can be linked back to a lack of market research and the absence of a marketing plan. Don’t skip this part. While you may get an idea for a book and think that it’s fantastic, the worst assumption you could make is that others will share your enthusiasm for it. Instead of relying on your own hunches, take the time to research your genre and find out what readers currently want in your genre. While researching your target audience, be sure to choose a topic that is broad enough to interest the largest group possible. It’s okay to be detailed, but try to avoid holding a magnifying glass too closely to your subject matter, as many will lose interest if you do. The other half of marketing research for book writing is studying the competition to see what is working and where you should focus your efforts. Monitor the most successful authors in your genre and learn from their examples. If you have an idea that you don’t see anyone doing, that either means it’s a great idea that you should jump on or there is probably a reason that no one is doing it and you shouldn’t either. Also explore other upcoming books on your subject. Two good sites to explore for this are NetGalley and Book Reporter. Cover promotional plans in your marketing plan as well. This is essential for your book to gain popularity after it has been published, and it needs to be as consistent as possible. Many great books go unnoticed while many mediocre ones climb the bestseller lists. It’s rather common. That’s why a plan is so important. Identify at least three unique ideas for your book. One of my authors planned to buy 100 of his books and send them to heads of non-profit boards in the city where his office was located. This ended up in a $30,000 training opportunity when one of the board members recognized the author would make a good trainer for his business development team. Develop a squeeze page where you release one-two chapters of your book. Here is an example by one of my most recent authors who is showcasing his book, “Million Dollar Sales Conversations.” He already has almost 100 people who have wanted the preview and also shown an interest in buying his full book. Create a free webinar. Setting up a webinar prior to your book coming out where you offer a sneak peak of your book can be effective in build pre-release book buzz. Local marketing is important and can have a huge impact on the popularity of your book and the volume of sales it brings in. Whether you write an article about your upcoming release for a local newspaper or hold a book-signing at a local bookstore or restaurant or some other cool place, local promotion is great for boosting buzz about your new book and giving it a strong start once you launch. One Indiana author was offered a nice advance and then got picked up by a traditional publisher after selling more than 5,000 books in his town. Also take advantage of social media to create additional buzz about your book. Social media is a must-have for both first-time and seasoned authors. Your readers and fans will expect you to have a presence on Facebook, Twitter and probably a few other social platforms as well. They will also expect your presence to be active and accessible, so using these channels to connect with them when they reach out can have a huge impact on your book sales and your overall author brand. Check out The Author Marketing Club (affiliate link with proceeds going to my non-profit effort for teen tech literacy) that will provide you with a number of great tools for your book. As you can see, book success boils back down to the same requirement: a solid marketing plan for the book you plan to write and publish. Skipping this step can ruin the entire experience of becoming an author, which is why it’s so important to start planning even before you write the first word of your manuscript.